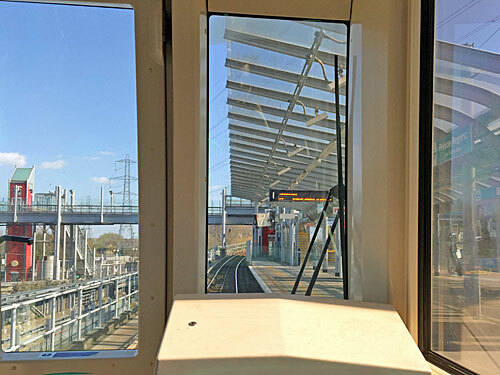 Twenty five years ago today the DLR extension to Beckton entered public service. This brand new branch headed east from Poplar and snaked into the Royal Docks, bringing a light rail service to new estates on the far side of Newham. For many years it was relatively lightly used, but blimey, how prescient the line looks today. To celebrate the silver anniversary I've been out to all eleven stations which opened on Monday 28th March 1994, several of which still look much like they did a quarter of a century ago. You're getting one photograph of each plus a brief paragraph of waffle. 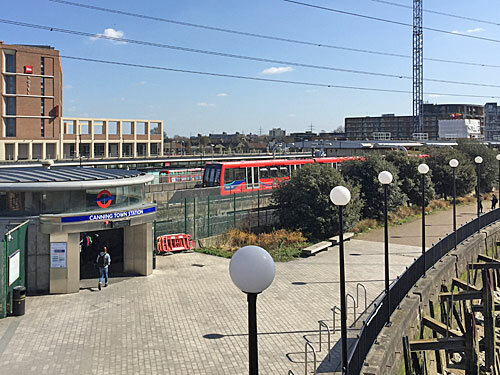 The first new station east of Poplar sits on concrete pillars beside an even concretier dual carriageway. Pedestrian access is always awkward but rather more so at this time of major local development, and approaching via the subway through the roundabout can feel somewhat dystopian. The Blackwall Tunnel passes invisibly to either side, one bore to the west and the other to the east. Station architecture is quite typical of what's coming up elsewhere - elevated platforms, wedge-top lift towers and steep glass-enclosed staircases. Named after the dock which used to cover the site, East India's big claim to fame is that the Greenwich Meridian passes across the tracks, and is marked by a line up the side of the adjacent apartment block. At ground level look for the diagonal line embedded in the pavement, which aligns approximately with the final lamppost on the eastbound platform and the second lamppost on the westbound. An additional footbridge leads across Aspen Way towards what is currently Tower Hamlets HQ. 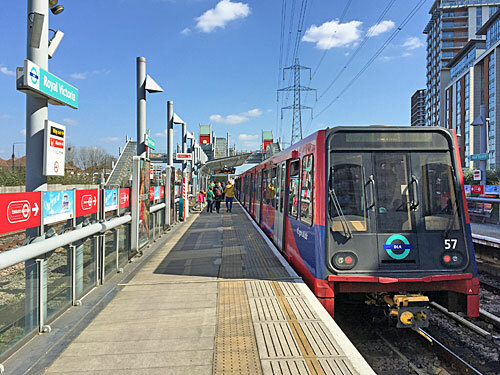 At Canning Town the new-born DLR linked up with the former North London railway line to North Woolwich, but not the Jubilee line because that hadn't yet been built. To facilitate its construction the DLR station had to be closed soon after opening, from June 1996 to March 1998, for total reconfigurement. The end result was a fabulously simple stacked Jubilee/DLR interchange, but requiring a proper slog to leave the station, and what's proved to be an impractically awkward interchange to what's now the Stratford International branch. The busiest station on the Beckton extension, by far. 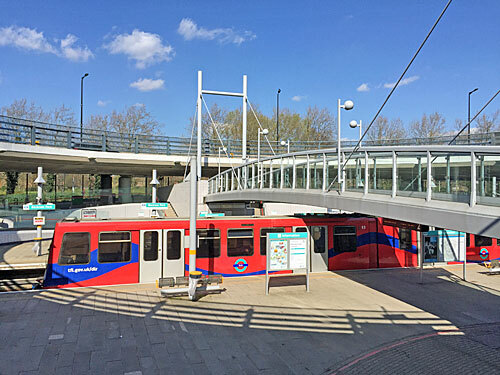 Here's a rare DLR station at street level, featuring the extension's trademark angled lampstands and ribbed platform canopies. It's also the closest station to London's only cable car, so suffers from promotional Dangleway material slapped across most available surfaces. 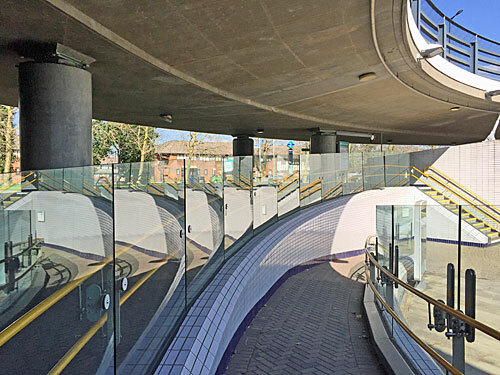 To celebrate the 25th anniversary the station's footbridge is getting a maintenance once-over, so is entirely inaccessible until next week, necessitating an unexpectedly long diversion to reach the other side of the tracks. Custom House is to be the fortunate recipient of a Crossrail connection, as twin roundels now exposed on its new lift tower proudly proclaim. 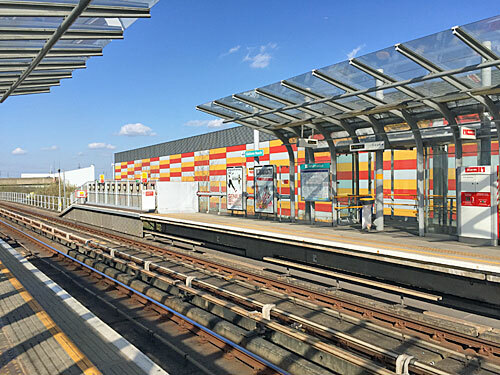 The DLR station was closed for most of 2017 while an upgrade allowed fresh connections to be made, before reopening in January 2018 with that work substantially incomplete and blue hoardings everywhere. Those hoardings are still everywhere and passageways still closed, even on the non-purple side of the station, and the resultant mess has been depressing international visitors to ExCel for well over a year. One day, though, wow. This is the DLR station whose name I have the most difficulty remembering, there being a surfeit of regal titles in the old Royal Docks. Prince Regent could instead be described as ExCel East, being attached to the other end of the gargantuan exhibition centre via a staircase worthy of a football stadium crowd. 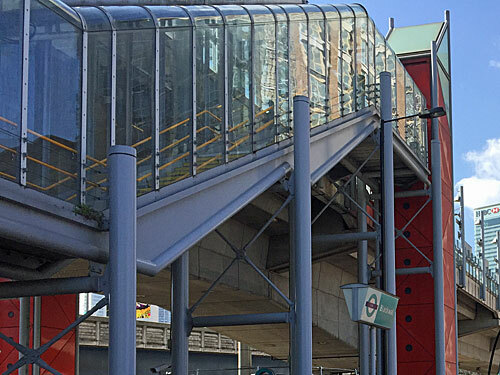 A separate lift and narrow staircase lead down to a small local bus station for local people, whose services will be diminished when Crossrail finally opens and certain bus routes are diverted to serve Custom House instead. To reach Royal Albert the line has wiggled, at height, between bland modern hotels and the edge of the Royal Albert Dock. 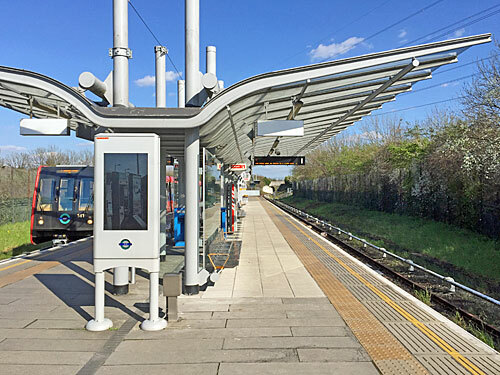 This station's located much further from the nearest houses in West Beckton than would have been ideal, and is no fun to access on foot, but is brilliantly located for Newham's waterside slab of council offices. Stop off here to watch planes vrooming at City Airport, to indulge in a splash of rowing or to cross the Connaught Bridge to the newer DLR branch to Woolwich. I wrote a whole post about Beckton Park earlier in the year, so I'll be brief. This is the least used station on the DLR, being both remote and buried inside a dual carriageway roundabout. It may not be the least used station after the southern fence is taken down providing access to the Chinese-funded ABP Royal Albert Dock development alongside, transforming the area utterly. The actual park is going to be the last thing visitors consider. This is another circular station embedded in the heart of an inaccessible roundabout, nigh identical to Beckton Park but a lot busier because people actually live here. 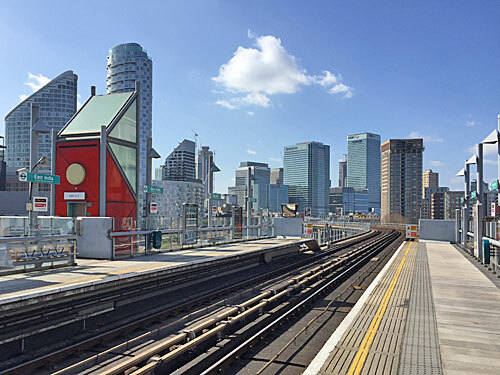 Many are students at the University of East London's Docklands campus, which is accessed through the southern subway past a frowning security guard. The station's unusual name comes from housing built in 1881 for local dock workers - the Cyprus Estate - a title which commemorated the island's recent acquisition by the British Empire. 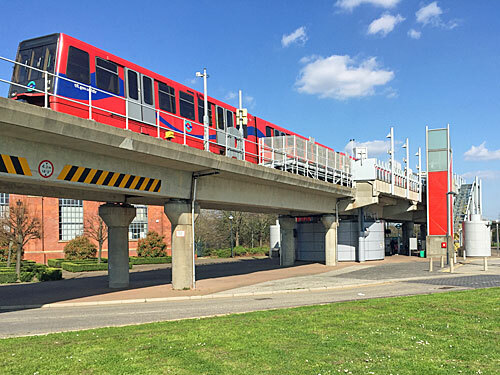 Gallions Reach is the easternmost DLR station, fractionally beating Woolwich Arsenal, once in the middle of pretty much nowhere but increasingly surrounded by speculative housing developments. If you haven't been recently, people actually live here now, and a lot more are coming. The DLR's largest depot is close by, along with the levelled remainder of Beckton Gas Works. One day a fresh branch might break off here for Thamesmead, but they once said that about Dagenham, and Mayors are fickle creatures. Finally the line curves back on itself to reach Beckton proper, ideally located for the bus station and the giant Asda. 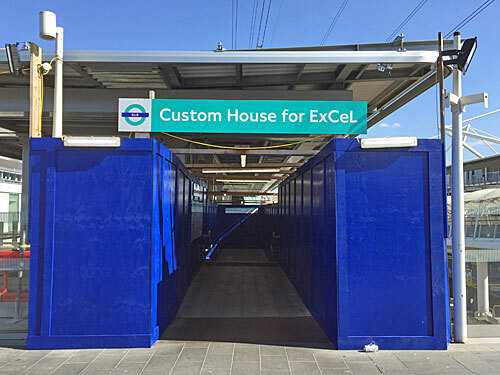 The front of the station has recently been brightened by a wall of multi-coloured tiles plus the word 'Beckton' in large blue friendly letters. Beckton's 1980s residential district is very low-rise and extraordinarily low-density by modern standards, hence potentially appealing, but has never been especially well connected. After 1994 there was at least a way out.